Transoms (which are located above main windows) and clerestory windows (which are typically located in rooms with high ceilings and occupy the upper half of the wall) are incredibly practical. They are found in stairwells, entryways, living rooms, kitchen, and even bedrooms. Transoms let natural lightin and are high enough to spread the light throughout an entire space. However, they are not always aesthetically pleasing. Often times they do not provide a view of anything accept the sky, and this can make them a boring focal point that does not fit in well with you interior. If they do provide a view, it is most likely one of your neighbors siding. They easily collect dust, and are very inconvenient to clean. Without the right solution, transom windows can be incredibly frustrating. The purpose of transom windows is to allow light in. Sometimes, you will find homes where people have covered them with blinds or curtains. This eliminates their functionality, as it is not practical or possible to open them without great inconvenience and a ladder. Stained glass is the perfect solution because it allows the light to still come in, and it also creates a piece of art that is now an interesting and appealing focal point. Where you once had nothing to look at except a hole in the wall, you now have a timeless piece of art. 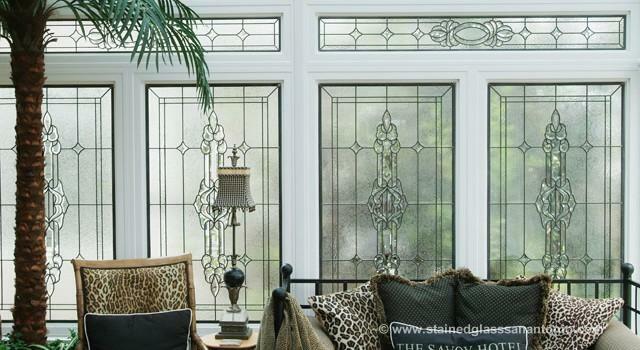 Stained and leaded glass will also help to mask the dust that higher windows collect overtime because of the textures. They never appear to be dirty. This will reduce the amount of time you take to clean your transom windows without ever allowing them to appear dusty. Scottish Stained Glass has worked with many transoms. They are often arched or triangular, but this does not mean that stained glass will not work for them. All of our windows are custom, which allows us to build them to any size or shape. Our designers will help to create a stained glass window for you and your transom which work well and balance within any shape you may be faced with. If you are interested in obtaining a new, unique piece of functional stained glass, please call or email us today, and our team will answer any questions you may have about your stained glass project. Our in-home design consultations are free and require no obligation.